Appropriately named for its picture-perfect waterfront views and peaceful atmosphere, Lake House Apartments offers the best in luxury living with contemporary features and resort-style amenities. Choose from spacious 1, 2, and 3 bedroom floor plans with sleek hardwood flooring, in-home washers and dryers, private patios/balconies, and roomy walk-in closets. Cook like a master chef in your gourmet kitchen with granite counter tops, stainless steel appliances, and modern cabinetry. Nestled in the charming Orlando suburb of Davenport, Lake House is ideally located just minutes from major attractions like Walt Disney World and Champions Gate's pristine golf courses. Schedule a tour to come see for yourself what makes Lake House so unique! Live every day like you're on vacation with a resort-style swimming pool and relaxing hammocks overlooking the lake. End the day grilling with friends, sitting by the fire pit, and watching the sunset from the newly constructed dock with bench seating. Easily conquer your health goals with our 24-hour health and fitness center or sweat it out at the sports courts. The community is pet friendly and welcomes furry, four-legged friends of all sizes (no weight limit). Choose from spacious 1, 2, and 3 bedroom floor plans with private bedrooms and roomy walk-in closets. 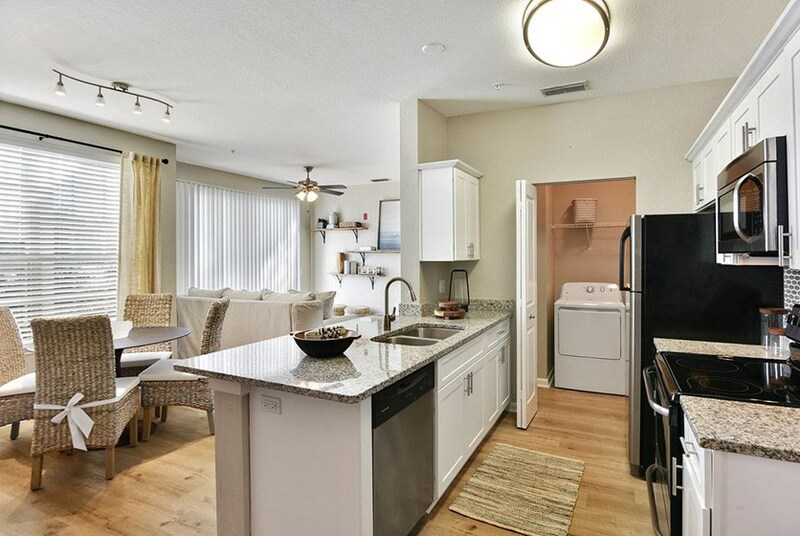 Gourmet kitchens come fully-equipped with stainless steel appliances, contemporary cabinetry, and granite counter tops. Live the luxurious lifestyle you deserve with sleek hardwood flooring, vaulted ceilings, modern lighting, and dual master bedrooms (in select apartments). Take in breathtaking lakefront views from your private patio/balcony -- ask the leasing team about availability. Every apartment home includes a full-size washer and dryer, with walk-in laundry room for added convenience. We've sent your message off to Lake House Apartments. If you'd like to chat with the staff immediately, feel free to call them at (407) 410-4851. If you would like to chat with the Lake House Apartments staff before your tour, you can call them at (407) 410-4851. We're checking availability for you now! Someone from the leasing team will contact you shortly. Meanwhile, please feel free to call Lake House Apartments at (407) 410-4851.